Lil Mike and Marie Loved going to Renaissance faires. At the faires even the grownups pretended to be knights and ladies. Everyone got dressed up, acted silly and ate with their hands. Marie and Lil Mike visited several faires during the season but when the little town of England put on its annual event Marie left the boutique in an employee's hands and Little Lady Witherton Rose and her Beautiful Mother went to sell their wears at the faire for three full days. Lil Mike had a beautiful set of dresses that Grandma Becca had made for her. She had a wreath of flowers for her head and her own little cup hanging from her waist. There was a list of events and performances that they could not miss, a market to browse and food to eat. Oh, yes Lil Mike loved Ren faires. Very early in the morning while it was still dark and damp many members of the family arrived at the grounds to set up the tent. The air was chill and made the excitement even better. All around them other groups and individuals were setting up their tents and booths. Some tents were plan and some like Marie's were very colorful. Morning arose to a wondrous sight. An arena had been set up in the middle of Poster's Meadow. Brightly colored banners and flags danced in the morning breeze. Bleachers were set up so that people could watch the competitions and jousts that would soon take place. Around the meadow in the trees were entire villages of tents. To the east could be found the food sellers' tents and gardens. To the west were the merchants of goods and wares. To the north were the theaters and performing stages. And, to the south was the camp of the colors. *What is the camp of the colors you ask? Well, tents in this area were grouped by color. Each color represented the house of a Lord and his Lady. Here, the couple and their servants, solders, and knights would camp out while competing in the contests and jousts. Each group wanted to become the champions of the faire. Competition was sometimes intense but always in fun. Marie's tent was a huge purple, red and green one with three sides and wind chimes hanging all along the open edge. When Lil Mike was smaller she had her own play area under the tables. Now that she was older she was having a harder time waiting to go exploring. Tables displayed many fine accessories from snoods for woman to feathered hats for men. Scarves, purses, and jewelry hung from stands. One table held beeswax candles and soap made with goat milk and honey that the family had made. Lil Mike and Marie rushed to get dressed up in their garb. The faire was about to begin. The other Roses headed home. They would come back to help and to browse when they could. Belle back at Cherry Hill Farm was pacing back and forth along the ridge of the barn. The Ren Faire of England was definitely not one of her favorite things. First, No pets were allowed so Pal and Buddy could not go. Second, June was a very busy time of year on the farm and people were riding off on tractors and climbing up ladders in orchards. They needed watching. Third, the whole affair always made her homesick. Everywhere you look at the faire there are figurines of flying horses and winged dragons, great eagles and flying lions. The woods are full of merry people. The campfires in the dusk are surrounded by dancing and song. It always made her want to sing a sad song. Belle's singing sad songs wasn't a good idea if you remember. At the faire things were going very well for Marie. People were coming in and browsing, buying and ordering more. Marie was so very busy. "Mama can I go look around?" Lil Mike asked. Marie forgot that the guardians were back at the farm. "OK but don't go far." No Belle, no guardians, no Grandpa James. It was the first time Lil Mike had ever been entirely on her own. She felt so very grownup and excited and just a little nervous all at the same time. She didn't really plan on going very far, just to the toy booth. She admired the funny little plague mice. A troupe of musicians came through singing and dancing. She skipped along for a while. A lady selling princess hats let her try some on. A puppeteer showed her how to make the puppets dance. Beautiful dancing girls came down the lane and led her to a stage hidden in the glade. The ladies danced and whirled to wild music and drums. Lil Mike danced and laughed. It wasn't until she got hungry that she looked around and realized that she didn't know where she was. Marie however had realized her mistake in just a few minutes. "Michal, Michal! She called. "Michal where are you?" "Can I help you milady?" A tall gentleman dressed all in leather and purple silk bowed before her. "Have you lost your son?" "No, I have lost my daughter," she cried. Marie was really frightened. "Michal!" she cried louder moving out into the crowd. Jillian wasn't here yet to help with the booth. But a mother is a mother and her baby was missing. "Please milady allow me to help. I will get the ground security and we will begin searching at once." The knight (for that is what he was at the faire) went into action. In just a few minutes he had security and a collection of elegantly dressed gentlemen and knights. They were all given a description of Lil Mike and were off in search of a very little girl in a very big place. Lil Mike lost and frightened didn't feel comfortable in the crowd (she was a country girl remember). She wandered into the woods until she came to a fence and then followed it along for several minutes. Suddenly she remembered what Grandpa James had told her. "When you are lost, stop and stay where you are and someone will find you." Lil Mike sat right down. No Belle, no guardians, no Grandpa James, It was the first time Lil Mike had ever been entirely on her own. She felt so very alone. She didn't like it. She wanted her mamma. She began to cry. Down at the horse corral a little black and white dog named Ronin set out for a walk. 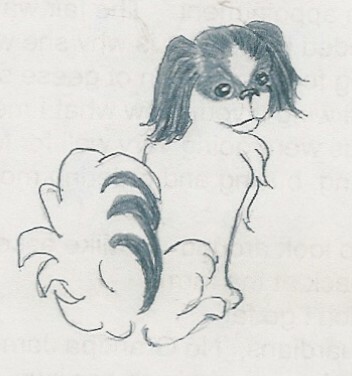 Ronin is a little Japanese chin, a very unusual type of dog with a pug nose and boggy eyes. Ronin was known for his sweet nature but, he could be very ferocious when it was needed. Chins had been used as royal guard dogs in Japan. They were intelligent and daring. Pets weren't allowed at the fair but he belonged to one of the knights. So he spent the day with the knight's horses. Ronin was sniffing along in his prancy way when who do you think he found? That's right. Lil Mike. Ronin stopped and looked her over. "Well my, my. This little one needs help." He wasn't sure what to do but he knew someone who did. Taliesin, the beautiful black Friesin horse that he stayed with. Taliesin was very wise. Ronin was in Taliesin's pen as quick as a wink (our Wink at that) . "Tally there is a little girl out there and she needs help what can we do?" Ronin barked in his squeaky, growly way. At that moment the kind gentleman who was helping Marie came into the pen. "Come on Taliesin," he said, "we have some work to do. There is a little girl lost out here and we need to find her." "That's a great idea," Taliesin snickered with a wink at Ronin. The man jumped right up onto Tally's grand black and purple blanket, and opened the pen. "Lead the way," Taliesin called to Ronin. Ronin dashed off toward the fence. The gentleman was very surprised when Taliesin leaped after Ronin like he was starting a jousting charge. The knight without his saddle nearly fell off. He yelled and grabbed his feathered hat but Taliesin wasn't stopping. The startled man had just gotten himself aright when he saw where his crazy pets were going. "Well I'll be a blind jester," he exclaimed. Lil Mike looked up when she heard the horse coming. She had never in all her life seen anything more beautiful. 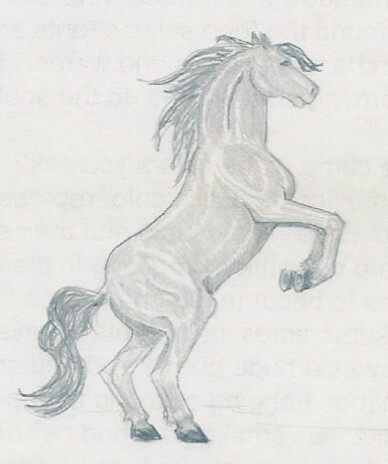 Taliesin was a very elegant horse all dressed very fine and the grand knight with his hat decorated with purple feathers had regained his grand style just in time. Little Ronin jumped right into her lap. The Purple Knight slipped off his steed and bowed with a grand sweep of his hat. "Could this be a lady in distress?" he asked. "I know a very worried mother who is looking for her little girl. Would you by any chance be Michal Hanna Witherton Rose?" "Yes" Lil Mike answered very quietly. "May I give you a ride milady?" "I see," the knight smiled. "Well how about if you ride Taliesin and I walk along?" Lil Mike thought about it. "OK," she said. "Can he come too?" She pointed to Ronin. Little Lady Michal Hanna Witherton Rose was escorted by a very grand purple knight right through the faire. People everywhere began to cheer and follow along. Taliesin pranced proudly and Ronin stood tall and proud in front of Lil Mike. When they reached Marie, Lil Mike fell into her mother's arms and the whole crowed roared up a cheer. It was at that very moment a huge flock of geese swooped down extremely low overhead in a marvelous display of precision. "Wow," the crowd cheered again. Belle had arrived. (Of course they didn't know that.) Belle recognized Taliesin at once. He had spent time at North Side Farm after an accident. That evening he gave Belle a full report. Belle thanked him and gave a kiss to Ronin. Lil Mike became the Lady of the Faire. The knights jousted in her honor and she got to sit next to the queen. But her heart was taken by the Purple Knight and she carried his favor (a purple scarf) everywhere she went. Marie and Lil Mike were invited to join the Camp of the Colors in the evening. So Lil Mike got to see her handsome knight often. As Marie buckled Lil Mike into the car for their ride home to Cherry Hill at the end of the fair Lil Mike held her favor tightly and announced. "I'm going to marry the Purple Knight when I grow up." Marie didn't sleep very well that night. Her baby was growing up way too fast. Belle had been horrified when she heard what had happened to Lil Mike in her absence. The very moment she got home she made herself an alarm clock. She was never going to miss an appointment again.